One day I look forward to every month is the 28th. Why? Because that's when my baby girl Jane is another month older! 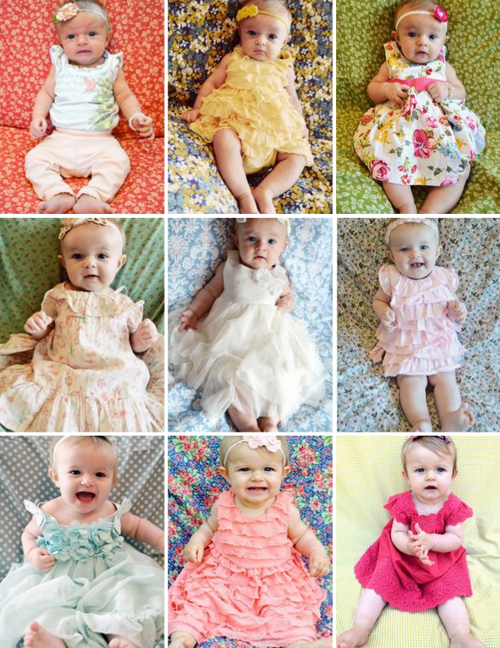 Before she was even born I went to JoAnn Fabrics and picked out 12 girly and fun yards of fabric as backdrops to photoshoots I wanted to take every month leading up to her first birthday. I'm proud to say I've kept up with my monthly goal so far - we're up to 9 months! And what are photos for if not to be scrapbooked? One of my very favorite topics to scrap is my children and their milestones/accomplishments. I hope one day they'll love looking through their albums and seeing their first time eating rice cereal, first steps, monthly updates, travels, holidays, and such. So, every month on the 28th, I select one of the fabrics and choose a frilly dress and matching accessories to go with the fabric. If I happen to have a certain scrapbooking line that I want to use, I even go as far as to coordinate everything together! Please tell me I'm not the only one who does this! Once I have the fabric and her outfit chosen, I tape up the fabric to a wall outside in the shade and plop Jane on the fabric. As she's gotten older she's become more and more mobile and distracted so I have to keep the photoshoots brief and just take as many pictures as I can before she gets antsy or grumpy or both. Having her big brother Fox there to entertain her or a fun toy gets me a few extra seconds of cooperation! Once the photos have been snapped I put the camera card reader in my computer and select my favorite dozen or so pictures to edit and eventually scrap. Then I'll compose a blog post of all of her growth stats and latest and greatest accomplishments from the last month. I send the photos to Costco.com to print, along with a few other photos I need printed that I want to scrap, and pick them up a few hours later. When it's time to sit down and scrap the photos I pull products that match the fabric backdrop and Jane's clothes. Like I said, sometimes I pick the scrapbook line first, but usually I coordinate from the photos afterwards. I love to use lots of doilies, jewels, pearls, and frills on these monthly layouts of Jane. The frillier the better I say! Then I open up my blog post and try and include as many of the details in the journaling as I can. Sometimes I handwrite the journaling, sometimes I make it on a typewriter - whatever I think goes with the nature of that particular layout. Once I have Jane's 12 monthly layouts made I haven't decided if I'll put them all into a special album or just keep them in her chronological album. I plan to make a final layout with one photo from each of her monthly photoshoots, just like I did with my son Fox, to culminate in a final hoorah! 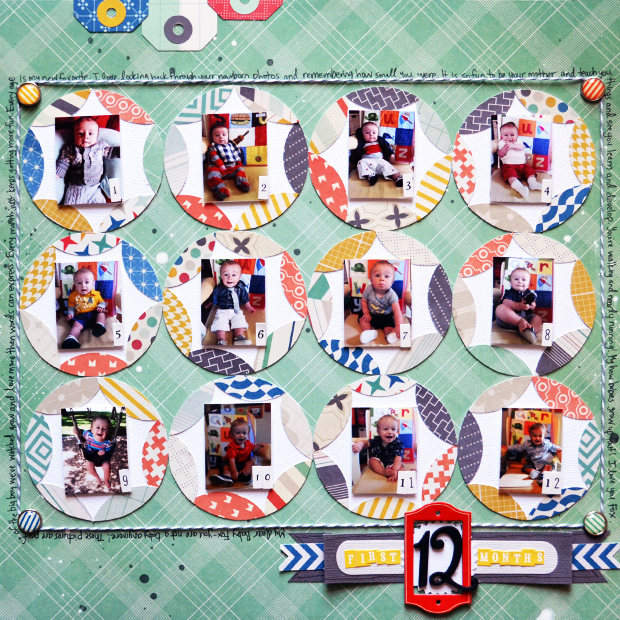 I hope you are inspired to scrap monthly photos and document the milestones in your baby's lives! so cute!! love how everything matches so well!!! what a cutie and seeing how big she is getting!!! LOVE all the pages!!! They are all so gorgeous. I love your style, and I love the idea of doing a layout for each month. Love love love all of these!! You always have such wonderful ideas. Thanks for sharing! These layouts are all incredible! Our kiddos sure are lucky to have you to so thoroughly document their lives! She is soooooooooooooo cute!! I love love love your lo's!! They are gorgeous!! nope, you are not the only one who matches everything. I have actually made my kids go back in the house and change to match the paper! She is just too dang cute! I've come to look forward to each month's layout as well. It's amazing to see them all together. wow Jane sure will have one fabulous baby book, your pages are so unique and fun, what a lucky girlie she is! Stunning layouts! Oh, yeah, the subject is so very cute too ;-)) Love that you posted all the layouts in one post. Love your blog posts!